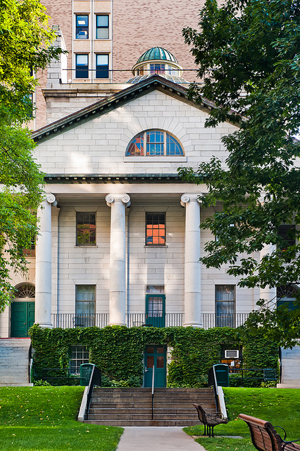 The hospital's original building, opened in 1821, takes its name from its famous architect, Charles Bulfinch. A National Historic Landmark, it is an excellent example of Classical Revival architecture and a rare surviving example of an early 19th-century public hospital building. At the top of the building is the Ether Dome—the hospital's original operating room, which was the site of the first successful public demonstration of anesthesia in 1846. Between 1821 and 1868, more than 8,000 operations were performed in the Ether Dome. Visitors can explore the unique architecture and a small collection of artifacts, including an oil painting of the famous first surgery, an Egyptian mummy, and early surgical tools. Access: Go through the hospital's main entrance. Proceed straight, then turn right after Coffee Central. Take elevator or stone stairs to the fourth floor. While you're here, don't miss the nearby Paul S Russell Museum of Medical History and Innovation.